Si vous appréciez votre intimité pendant les vacances, nous disposons d'une cabine confortable dans un paradis tropical, dans notre jardin! Les clients ont toute l'intimité dont ils ont besoin dans leur propre chalet; ils vont et viennent à leur guise, en ayant toujours la possibilité de se détendre au bord de la piscine sur les chaises longues ou dans la pergula de style zen. Notre cour est un demi-acre, donc il y a beaucoup de place. La piscine entre notre maison et la cabine. La cabine dispose d'un nouveau matelas king-size Tuft & Needle, d'une télévision à écran plat 32 pouces, d'une connexion Wi-Fi, d'un four micro-ondes, d'une cuisinière à gaz, d'un réfrigérateur, d'une douche (sans baignoire). Il y a une laveuse / sécheuse extérieure pour les clients. Vous obtiendrez une télécommande pour le portail électrique. Petite salle de repos avec douche, pas de baignoire. Got stuck between houses, and needed a place to stay for a little over three weeks. Got lucky with this place, it was just about perfect in every way. Quiet, peaceful, convenient to lots of things, and of course Joanne and Louis were excellent hosts. Even the dog was a delight, and we’re not dog people. If we ever make our way back to south Florida I would definitely stay here again. It was private and clean. We were close to the beach and a great recreation area in Pompano beach that included a golf course, bike/walking trail, Publix Market, and numerous restaurants within close walking/driving distance. Lou and Joanne were very friendly and accommodating. It was very comfortable and met all our needs. In the 2 weeks we spent there, it definitely was our home! A wonderful cozy cottage. Beautiful landscaping and a cute pool. Had a very relaxing time. The cottage is quite cozy surrounded by palm trees and other beautiful trees. Nice little pool. The landscaping along with the fun decorations are interesting and lends to a pleasing experience. The color scheme is so Florida! Joanne and Louis are wonderful. Very friendly, accommodating and helpful. We really enjoyed our stay.! I am happy to write a review of Joanne's and Lou's cabin and property. As I told Joanne and Lou after we (my wife and I) first saw the cabin and property, they are lovelier than in the photos. We immediately felt at home upon meeting Joanne and Lou and being introduced to our home which we had booked for two weeks. That feeling never left us. Joanne and Lou are perfects hosts--they are always available for any question or issue and give you all the privacy you might want. More on this below. The property is located in a quiet neighbourhood. If you love walking there are two parks nearby. The one we went to was a two minute drive in the neighbourhood. It has several baseball fields around which is a track for walking. It also has an aquatic facility, tennis courts, basketball courts, volleyball courts and pickle ball courts. The walk also takes you thru these facilities if you so wish. It was great. Groceries and restaurants were also very handy. We were happy we read Joanne's and Lou's recommendations on restaurants. We especially liked the Sicilian Oven and some of the best pizzas we've ever had. But Lou gave the Sicilian Oven a run for its money because he is a master pizza chef himself. Lou makes his own dough and cooks his favourites in his own wood-fired brick oven on the property. We were lucky enough to be invited to partake in his culinary creations. They were yummy. Thanks again Lou and Joanne for that memorable evening. The beach is only a five minute drive away. We have a tip for you if you like a less crowded part of the beach. Head east down Atlantic. Turn right on the A1A. Take the first left. We had no problems finding parking. Good luck. I can't conclude with commenting on the beauty of the property. Both Joanne and Lou have done and are doing a marvellous job of making the property esthetically and serenely pleasing. The landscaping is phenomenal and don't be surprised to see Lou being the landscaper extraordinaire. Joanne has "decorated" the property with a Far East motifs pleasing to the eye and calming to the spirit. So as you can imagine, we have no reservations in highly recommending this cabin and property. You will not be disappointed. One final note. Hammie, the canine family resident, is a real doll. No worries there. Robert and Susan are wonderful people and lovely guests! Their needs are few. It was obvious they were enjoying each day because every time we saw them in passing, they were on the go. They really enjoyed going to the beach, shopping & dining in town, and relaxing at night. Susan and Robert took care of our cabin as if it was their own home. We highly recommend them as excellent guests and feel that we were lucky to meet them. They are welcome back any time! This was our first VRBO and we were sold not only on the charming accommodation, but the graciousness of the owners. The cabin was clean and well-stocked with basic needs thoughtfully addressed. The grounds are well maintained and interesting with gargoyles Buddha's, and other assortments of statues to ward off evil and elicit peach and stability. And, we had our own little VRBO watchdog, Hammie, who kept an eye on us. Such a sweet doggie. We highly recommend the "Cozy Cabin"
Super clean and convenient to everything. Joanne is very helpful and the property is lovely. This was my second time and it's just as nice as it was a year ago! 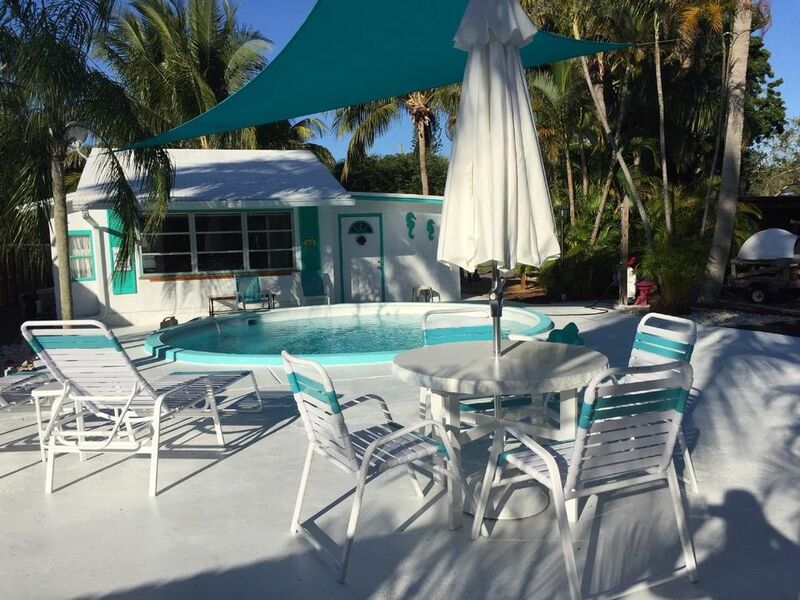 There is no entertaining allowed on property, as our insurance covers only the two adult guests, no children, no smoking, no pets, we are looking for travelers looking for a quiet, clean, safe place to use as a home base while checking out South Florida. The cabin is located in our quiet back yard.